Stop me if you’ve heard this one before…you bring your car in for a service. Something routine enough that you just prefer your mechanic takes care of, like an oil change for example. The mechanic then informs you that your air filter is in dire need of replacement. Sounds like a straight forward enough job that shouldn’t drive the cost up by any significant amount and won’t keep you waiting. You’re here already, so why not. Two birds, one stone right? You go to pay and are surprised to find that the cost has doubled as a result of this small job. You say nothing, pay and vow never to just agree to that job on your car without first enquiring about the cost. Fast forward two years and you’re making the same silent vow to yourself all over again. The thing is, replacing an air filter is amongst the most straight forward maintenance jobs you can do yourself. It requires no specialist tools, the filter itself is not an expensive item, and it is a quick fix. 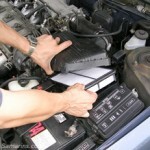 It is also one of the most beneficial maintenance tasks in terms of your car’s performance. What is your Air Filter? Air (or more specifically oxygen) is integral if an engine using petrol or diesel is to run. Without it these fuels can’t burn thus depriving the engine of the explosive force needed to power it. 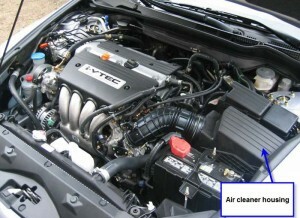 This air must be cleansed before it is fed into the air intake and combustion chambers. Enter the Air Filter – it cleans the air coming into the engine whilst also preventing various forms debris from entering. Why is it important to regularly change the Air Filter? Filters can only handle so much. After thousands of miles these filters inevitably show the signs of wear and tear. After all, these filters don’t clean themselves. A faulty or old filter can result in various forms of dust, debris and dirt clogging up the engine thus hampering its performance and fuel efficiency. By ignoring the Air Filter for a longer period of time you risk serious wear and tear by allowing a build-up of abrasive elements on engine components such as the bearings, cylinders and piston rings. This in turn can hamper the Air Filters additional task of regulating the ratio of air to fuel in the engine. If the engine is prevented from getting enough clean air, the fuel mix becomes rich putting the engine under more strain. There is no one-size-fits-all rule. 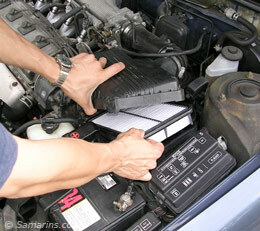 Some mechanics recommend changing the Air Filter every 3,000 miles / 4,900 km. Others would have you believe the best practice is to be vigilant for the tell-tale signs. Check it regularly yourself and replace as required. Best practice would be to check the owner’s manual and adhere to its guidelines. In any case, it never hurts to look given how simple a procedure it is. And it could end up saving you from costly repairs further down the line. 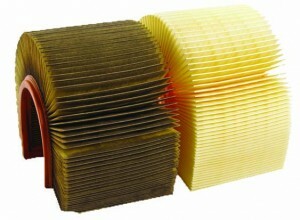 There are a number of tell-tale signs that your Air Filter is in need of replacing. Poor Performance: A loss of engine power (acceleration etc) can sometimes be attributed to a clogged Air Filter restricting the amount of air into the engine. Jumpy acceleration is another potential indicator of a faulty Air Filter. Poor Mileage: A decrease in fuel mileage is a common occurrence with regards to dirty filters. Engine Noises: If the engine makes strange noises when idling (generally these noises tend to be of the spitting / spluttering variety) then you should definitely check the Air Filter. First things first (and let’s assume you have already committed yourself to replacing the Air Filter), you’ll need to buy a replacement. Which you can do HERE. Next, you’ll need to get under the hood to where the Air Filter is located. The Air Filter is contained in a large black plastic housing at the side of the engine. There is usually a big hose protruding from it. Open this housing and remove the old filter. Now would be a good time to familiarise yourself with it. Check inside its folds for dust and other offending dirty particles. Replace with the new Air Filter. It should fit comfortably in. Close the Housing again. Schools nearly out. There’s a grand stretch in the evening. And you’re more than likely sitting at your desk daydreaming of your impending summer holidays. But you’re not quite there yet. There’s still the small matter of packing etc. 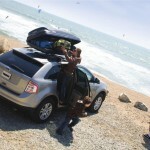 And therein lies one of the great holiday dilemmas – how are you going to fit all that luggage in with the family? Maybe you could leave the family behind?? There is a better (i.e. safer) option – the tried and trusted roof-box! Ranging in price from hundreds of euros to thousands of euros, there’s a roof-box fit for every purpose. So choose carefully. Here are some important factors to consider when making that decision. It will be used frequently or occasionally. It will be used just during the holidays and which season (summer or winter). It will be used as a portage complement or the main boot (in case your car is too small). Made of plastic or composite, the stiff roof-box are the most popular. Wide or tight, their aerodynamic shape offers better air penetration which limits over-consumption on fuel usage. It also offers you better protection against weather and theft. Flaws? Setting up often requires two sets of hands, while storing it when not in use requires a lot of space. Guide to selecting the right Roof-Box. Flexible roof-boxes are made of impermeable synthetic materials. Setting up only requires one pair of hands and they don’t require much storage space when not in use. However, they don’t share the aerodynamics properties of the stiffer roof-box, although the flexibility does allow you to adapt the size depending on the storage volume needed. This limits the wind loading when partially filled. Although generally waterproof, the flexible roof-box tends to require some maintenance to stay this way. Flaws? It’s particularly vulnerable to theft. Warning: Most of the cheaper roof-boxes are often poor quality, simple rectangular boxes, offering mediocre sealing and made of thin plastic materials, without inner straps and a poor locking system. Selecting the right roof-box is dependent on the luggage they will carry (as well as the Highway Code which states simply that “you must secure your load and it must not stick out dangerously”). Similarly, you must consider the car and technical specifications of the roof-box. Indeed, the latter only accepts a low filling mass (50 to 75kg maximum) but offers loading volume from 220 to 680 litres. Long, short or mixed, you can generally find 2 lengths (about 1m to 2.35m ) and 3 widths (about 75cm to 1.40m), depending on the manufacturer. First, you must check the quality and strength of your roof-rack and its anchorages. It’s the part that will support the weight. A fixation differs according to the price range. Some are more ergonomic and patented by manufacturers, particularly for mid-range and high end products. The most popular fixation. Each fixation adjusts itself according to the racks, via pre-drilled holes or by drilling the bottom of the box. So it is universal usage but not practical to set up, even more so if you have to use tools. Composed of a thread and a locking lever. You insert the ‘L’ part under the roof-rack, adjust tightening with a thumb-wheel and lock it with the lever. It is also universal but more practical to set up. These are evolutions of the U-Fixation. They are made of a U and a quarter rotation lock or locking lever. Each U adjusts itself according to manufacturer’s reference. Both universal and practical in usage. For stiff roof-boxes, the loading is made to the rear. The opening is either unilateral (right, left or rear) or bilateral (right and left). The latter make the loading easier, particularly in tight spaces or low roof rooms. Be careful of the positioning of your roof box – don’t place it too far to the rear or it could potentially obstruct the tailgate. Roof-boxes mostly close with Velcro tape or zipper. Some models are accessible by both sides. Stiff roof-boxes are often locked by keyhole at two points. Flexible models have a padlock. We advise you choose a keyhole which retains the key. 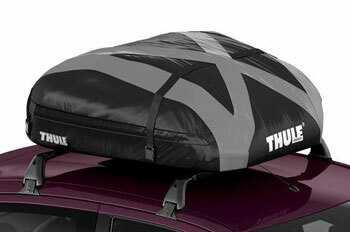 It avoids risks of driving with the roof-box open.